One of the best of the New Wave of Traditional Heavy Metal (NWOTHM) bands resides right here in Pennsylvania. Sinister Realm broke on the scene with their smashing self-titled debut in 2009, a substantial and pleasing platter of classic melodic heavy metal with obvious notes of doom metal. Sinister Realm returns with their second effort The Crystal Eye, introducing a new drummer, Chris Metzger, and a new lead guitarist, John Risko. Yet the traditional heavy metal remains, and Sinister Realm shows they know their craft, and genre, quite well. The Crystal Eye offers a varied platter of metal. Sinister Realm delivers melodic heavy metal with a strong, near rock, groove on the opener Winds of Vengeance or Signal to the Earth. Yet, they are even better when the arrangements offer intricate movements and shifts as on the aforementioned Winds of Vengeance, but also Tormentor and the instrumental Battle for the Sinister Realm. The Realm ventures into psuedo-power metal with the fast paced With Swords Held High, which also has a dynamic vocal arrangement and exciting guitar solo. The guitar work truly heats up on The Shroud of Misery. With a moderate pace it features Alex Kristof's eloquent metal vocals in combination with generous solos from both John Kantner and John Risko. Not to forget the rest of the band, founder and bassist John Gaffner and drummer Metzger deliver fine performances across the work. For Gaffner take note of either Winds of Vengeance or Tormentor; for Metzger consider Signal the Earth or With Swords Held High. Echoes of doom metal are heard throughout The Crystal Eye, notable on the just mentioned The Shroud of Misery. It's also found within the title track, perhaps the most lackluster cut here. Excepting the fine guitar solo and the acoustic outro, it offers a deliberate pace with little variation. But for a singular devastating application, it comes on the concluding piece The Tower Is Burning, a heavy, somber and foreboding piece. With only the aforementioned reservations, which are nearly inconsequential, on The Crystal Eye Sinister Realm delivers another fine and representative work of traditional heavy metal. For the American side, Sinister Realm are quickly setting the standard for the renaissance. Strongly recommended. 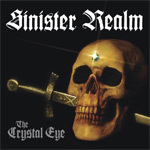 On The Crystal Eye Sinister Realm delivers another fine and representative work of traditional heavy metal. For the American side, Sinister Realm are quickly setting the standard for the renaissance. Strongly recommended.